Moving Ahead Services offers a larger plasma T.V. kit than our kit that is built for T.V.s of 26” up to 46”. This larger plasma T.V. kit will accommodate T.V.s from 26” up to 61” and is not suitable for older styled T.V.s or tube T.V.s. The plasma T.V. kit is a great way to offer protection for your T.V. during its transport to your new home and keep it safely contained. Constructed from thick and sturdy cardboard, the plasma T.V. kit will be rigid against opposing forces and maintain its shielding shape under almost any circumstances. Oftentimes, people will save the original box that their plasma T.V. came in and use the box to pack their T.V. when they move. However, this is something that, with our own expertise at Moving Ahead Services, we do not recommend for several reasons. 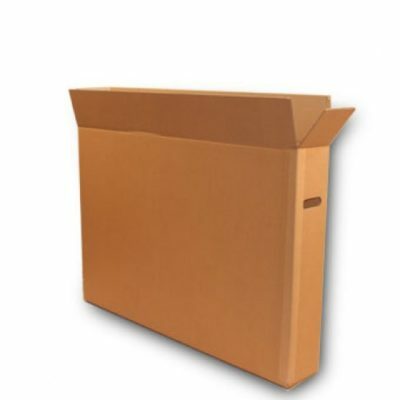 For one, your original box will have likely undergone extensive wear and tear. Even if you just stuck it in a closet where it was untouched by other objects, the cardboard would still probably suffer from natural decay and be weaker than it once was. For another, your original box has already been open, and probably not so neatly, meaning that it will be more difficult to reseal. By using a fresh plasma T.V. kit, you are enabling more optimal protection for your T.V. with strong material that will seal securely. The plasma T.V. kit is designed to be slid into a vehicle on its side or to lie flat, though you should never load anything on top of it or put it in a position on top of a pile of objects where it may slide off as the vehicle moves. You may want to consider having our certified movers load and unload your plasma T.V. kit for you so that they can ensure its utmost security in your chosen vehicle.